Home » Fact-Checks » Does Moving to Canada Trump Staying in U.S.? Many people who are concerned about living under Donald Trump as U.S. president have been repeating this sentence in recent weeks and months. On Election Day, the website of the Canadian immigration office broke down completely. Too many people tried to get information about the immigration process in Canada on Tuesday, Nov. 8, 2016. According to Google Trends, 100 U.S. citizens, compared to the normal two, looked up “move to Canada” on the search engine. And the numbers didn’t did go back to normal until two days after the election. Canada isn’t the only place where Americans want to move. The immigration website of New Zealand suddenly had 56,000 visitors, compared to the normal 2,300 visitors a day. Truth be told, is it really that easy and useful to leave home and migrate to Canada, New Zealand or countries in Europe, the Caribbean and other parts of the world? Some members of racial and ethnic groups have expressed a desire to leave the United States, because they believe that Trump won’t support them as president. They fear what will happen to their rights during his time in office. In the past, some black people saw emigration as the last option for them to achieve freedom and equality. During the late 18th to the 19th century, African Americans left the United States to live in countries such as Haiti, Sierra Leone or Liberia. They hoped to find equality and full citizenship there in contrast to separation, racism and restrictions in their home country. Today, the United States is the No. 1 destination of immigrants, who totaled about 47 million here in 2015. The same year only 3 million people left the United States to live in another country. Most of them left for Mexico. Canada is ranked second among destinations for immigrants, but that could possibly change based on recent interest in moving there. It is easy to move to another country, said Elizabeth Ferry, research professor at the Institute for the Study of International Migration at Georgetown University. “There’s paperwork involved, of course, but except for immigration issues, it’s not much more difficult than moving to another place in the U.S.,” Ferry says. So moving to another country is easy, but what about actually immigrating to it? Michelle Mittelstadt from the Migration Policy Institute points out that different regulations might impact how easy it is for U.S. citizens to move to another country. The more an immigrant has to offer in meeting a country’s needs, the easier it is to get a visa. Canada is a very attractive place for Americans with its proximity along the northern border of the United States. People can currently apply for more than 60 programs there, according to the Canadian Immigration office. They just need to find the right ones for their status, considering their skills and family status. In addition to searching for the right program, immigrating isn’t cheap. Applying for a working visa costs applicants $550, and it doesn’t guarantee that they actually get the visa in the end. Another thing people who want to leave the United States should consider is that the entire application process takes time. Sure, U.S. citizens can stay in Canada for 180 days without a visa. But they won’t be able to work or have any rights of Canadian residents. Even an Express Entry Visa can take up to one year, according to the Canadian government, and the applicant has no guarantee that he will actually receive it. He’s just in a pool with other people who have certain skills that are needed in the country and who have a job offer in Canada. A normal working visa can take up to two years, allowing immigrants permanent residency in the country to live and work there just as the normal Canadian citizen. The difference is: Permanent residents can’t vote in Canada and might lose their status if they don’t spend two out of five years there. But permanent residents in Canada still need to pay U.S. taxes, the Internal Revenue reports, because they are still citizens of the United States. Obtaining citizenship in Canada or New Zealand takes even more patience. Permanent residents can apply for citizenship in Canada after four years; in New Zealand after five years. 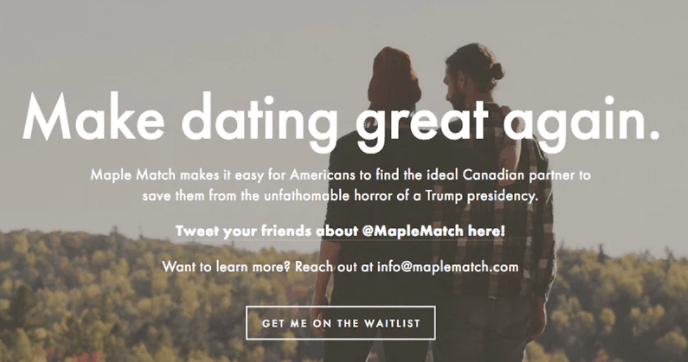 Online dating site MapleMatch.com mentions Trump in an offer to connect Americans with Canadians on its home page. And for all the people who thought they could just marry a citizen from Canada or New Zealand, neither country guarantees citizenship within marriage. The application process is the same as the standard citizenship request, but it might be cheaper and easier to explain the real reasons for seeking immigration. At the moment, no one can truly confirm whether people are actually moving to Canada or another country because of Trump’s presidency or for other reasons. It’s also difficult to determine if they want to leave the United States forever and become citizens or to move only for the four (or eight) years that Trump might serve in the Oval Office. Elizabeth Ferry doesn’t think many people will actually take the step of becoming citizens. “It’s a big move for people and depends on Canadian immigration policies,” the Georgetown migration researcher says. Emigrating isn’t the easiest thing to do, and every country its own rules. It can take a long time and tax obligations might not disappear. Interested people should try to find a job in the country where they want to gain residency. Without a job, they have a limited chance of living in another country for an extended length of time.